Simply have Alarm New England takeover your existing system at no cost to you. Or build a completely new system! Control your home security system through an app on your phone, wherever you are. Thanks to our more reliable and personalized service, our happy customers stay that way. Check out their experiences. Home security systems aren't one-size-fits-all. You can design a system over the phone that’s perfectly tailored to you in just a few minutes. All Alarm New England employees have been thoroughly background-checked and our licensed technicians satisfy all state and local requirements. 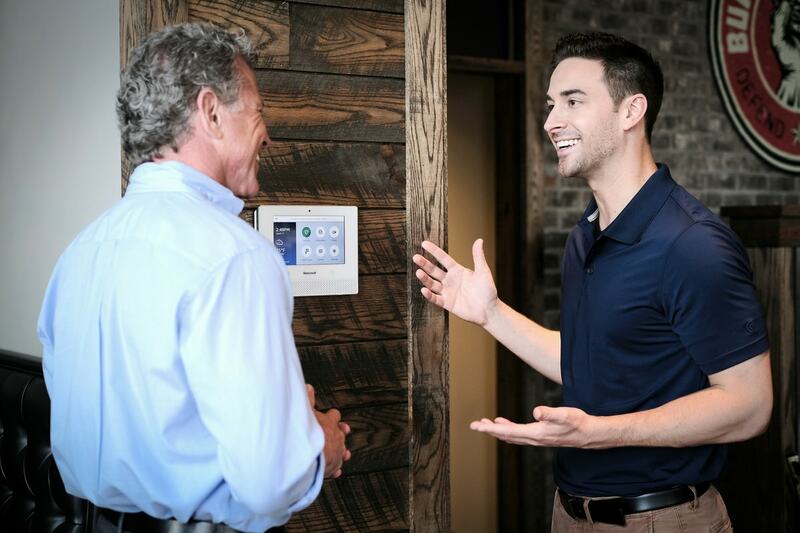 Security is all we've ever done for almost half a century, and we've climbed the ranks to become among the top 50 alarm companies in the country. Our UL Listed alarm monitoring station meets the highest safety standards in the industry. Our operators look out for your home and business 24/7. keep your home safe 24/7. Control your entire smart home security system with our top-rated app, available on iOS and Android devices. Receive alerts when events happen, such as extreme temperature changes, water leaks, motion detection or doors opening. Arm or disarm your home security system, unlock or lock doors, turn lights off or on, and adjust the smart thermostat with a simple tap. Get a clear view in and around your home, day or night. Receive video clips on your smartphone when your cameras sense motion. Alarm New England has been one of the easiest alarm companies to work with. Their technicians are very knowledgeable and office personnel are always helpful. They were very helpful with my self install. Connie solved all my problems and was very courteous. Over the past two years my system has performed as promised. I recommend Alarm New England for your security needs. There are not enough good things to say ... purchase and set up were smooth and flawless, support has been fantastic and the technology used is top notch. So far, they have delivered everything they said they would and the installation work was done at the quoted costs. They were and have been very easy to work with. I have no reservations about recommending them to others in need of alarm companies that take care of their customers. I have recommended this company to several people. I have been nothing but satisfied with them since day one. Not many other alarm companies go above and beyond for their customers these days. Had a great experience with sales team, installation team and billing - when I had to have an issue resolved. Overall, very good experience, great service and smart app for arming/disarming system. Have an old alarm system and looking for new alarm companies to switch to? We can transfer you over for no upfront cost. Serving Brookline, Cambridge, Newton, Lexington, Belmont, Sudbury, Wayland, Cochituate, Boxborough, Westford, Arlington, Hopkinton, Sharon, Wellesley, Natick, Andover, Acton, Carlisle, Lincoln, Needham, Dover, Winchester, Medfield, Southborough, Weston, and more. Serving Avon, Simsbury, Southport, Westport, Greenwich, Farmington, Glastonbury, New Canaan, Fairfield, Darien, Windsor, Wilton, Weston, Granby, Canton, Trumbull, Easton, Cromwell, Wethersfield, Newington, Milford, Southington, Middletown, Stamford, and more. Serving Bourne, Sandwich, Mashpee, Falmouth, Barnstable, Hyannis, Yarmouthport, South Yarmouth, Dennis, Brewster, Harwich, Chatham, Orleans, Eastham, Wellfleet, Truro, Provincetown, and more. Serving Cranston, Warwick, Pawtucket, Woonsocket, Kingston, Coventry, Cumberland, and more. Serving Taunton, New Bedford, Wareham, Fall River, Nantucket, Martha's Vineyard, and more. Serving Kingstown, Charlestown, Jamestown, Newport, Portsmouth, and more.